Cartagena, also known as Cartagena de Indias, is a city towards the northern coast of Colombia in the Caribbean Coast Region as well as the capital of the Bolivar Department. The city was established on June 1, 1533 and was named after Cartagena, Spain though the settlement of this region surrounding Cartagena Bay of various native people dates back to 4000 BC. At the time of the colonial era, Cartagena played an important role in the administration as well as the expansion of the Spanish empire and was a centre of political and economic activity which was due to the presence of royalty and affluent viceroys. Towards 1984, the colonial walled city of Cartagena and the fortress had been designated as a UNESCO World Heritage Site. The city initially, was the first Spanish colony on the American continent as well as one of the first sanctuaries of freed African slaves in the Americas. Presently it is populated by an ethnic mix representative of Colombia’s own range. According to the 2005 census, the port city comprises of a population of 892,545. It is the 5th largest city in Colombia as well as the second largest in the region following Barranquilla. The Cartagena urban area is also considered to be the fifth largest urban in the country wherein economic activities comprises of maritime and petrochemicals industry together with tourism.Cartagena was also an important trading port especially for precious metals where gold and silver from mines in the New Granada and Peru were laden in Cartagena on the galleons that were bound for Spain through Havana. Besides this, Cartagena was also a slave port where Cartagena and Veracruz – Mexico, were the only cities that were authorized for the trade of African slaves. The first slaves is said to be transported by Pedro de Heredia and were utilised as labourers incane cutting to open roads, to destroy the tombs of the aboriginal populations of Sinu as well as to construct buildings and fortresses. Cacheu, the agents of the Portuguese company, sold slaves from Cartagena to work in mines in Venezuela, the Nuevo Reino de Granada, the West Indies and the Viceroyalty of Peru. Cartagena is the most popular city in the country for tourists and tends to get crowded during December holidays as well as the holy week, when schools are closed and most of the Colombians are on a vacation. The city has two interesting sites to explore where tourist tend to go, namely the walled colonial city `Ciudad Amurallada, which is amazing with several fancy restaurants, clubs and hotels together with long strip of hotel towers and condos near the beach, which are known as Bocagrande. Visiting the elite neighbourhood of Castillogrande is also appealing which is filled with recently built condos, a serene beach to soak up some sun as well as places to do some jogging. Cartagena a modern port city on Colombia’s Caribbean coast has at its core, the walled Old Town, comprising of 16th century plaza, cobblestone streets with colourful colonial buildings. Having a tropical climate, it is a popular beach destination. Nearby shores like the Isla de Baru and Isla del Rosario, known for their coral reefs and scuba diving, can be reached by boat. Cartagena’s most appealing charm is its historic old town which is surrounded by the city wall where the main entrance is the Clock Tower building. The walled city comprises of the neighbourhoods Centro, San Diego, Getsemani as well as the modern segment La Matuna while the oldest section of Cartagena is surrounding the Plaza Trinida in Getsemani. Its 500 hundred year old coral stone forts together with the great parts of its walled city are amazingly intact, representing some of the beautiful examples of civil as well as military architecture of the Spanish colonial era. Castillo de San Felipe, a fortress which had been designed by Richard Carr, the Dutch engineer, had been built in 1657 by the Spanish for the purpose of protection against the pirates at the time of shipping gold out to Europe. In the proximity of San Felipe fortress is the 150 m high La Popa hill that provides amazing glimpses over Cartagena as well as the harbour region. Santa Cruz monastery, of 17th century has beautifully restored courtyard together with fine image of the Virgin of La Candelaria. Tourists are advised not to walk up here, since it could be a bit dangerous. Most of the churches in the historic area are worth exploring especially the Iglesia de San Pedro Claver, which was built in honour of the priest St Pedro Claver, who was the first saint of the new world for his work with the slaves. 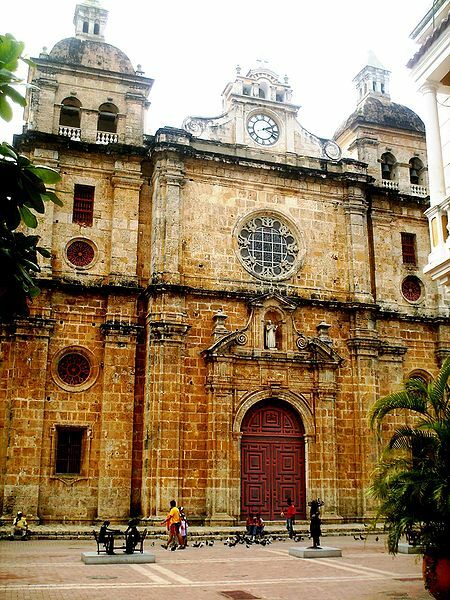 Besides this, La Catedral, near Plaza de Bolivar and the Iglesia de Santa Domingo are also worth visiting.